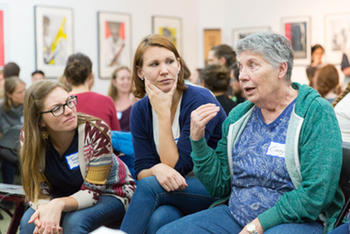 ​Want to get involved with SURJ Bay Area? Come learn about our current work and activities. SURJ moves white people to act for justice, with passion and accountability, as part of a multi-racial majority. There will be speakers from the Arab Resource and Organizing Center (AROC), which envisions powerful and liberated Arab communities living with dignity from here to Arab homelands and sees the liberation of Arab people inextricably tied to the liberation of all people of color. Part 2 of our Legislative Series: learn about lobby visits, Essie Justice Group's policy priorities, and opportunities to get involved. SURJ Bay Area's Queer and Trans (QT) Committee is hosting a screening of Pride, which highlights a true story of solidarity across identities for social and economic justice.